Left-Handed 2nd Baseman (full band) performs w/s/g Ocular Panther. LH2B is the creation singer/songwriter/producer Fran Broderick. Fusing diverse influences ranging from alt-folk to soul to synthpop, the result is stirring anthems and tender ballads, anchored by Broderick’s captivating lyrics. Rochester CITY Newspaper’s Frank DeBlase describes the music as a “joyous noise,” and writes, “you’re definitely going to want to get know the man and his work as Left-Handed 2nd Baseman…this is where Broderick shines. His words are gold.” His latest album, 2018’s Trench Digging During Peacetime, was nominated for Best Local Album of 2018 in CITY Newspaper, and the album’s title track is in regular rotation on college radio (WITR), and NPR (WRUR). 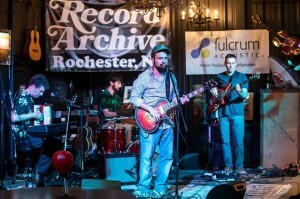 Having shared the stage with famed jam and folks acts like Max Creek, Ryan Montbleau, Ekoostik Hookah, and DJ Logic, and playing venues throughout Western New York, Manhattan and Brooklyn, Broderick is a seasoned performer constantly expanding his soundscape with styles ranging from Dylan and Springsteen to synth acts like Future Islands and Chvrches. He is probably listening to John Prine right now.